Apropos Of Something hosts Ellen Daniels and Nancy Laurence talk with Leona Sevick PhD, award-winning poet, Provost and Prof. of English, Bridgewater College, advisory board, Furious Flower Poetry Center, on her new book Lion Brothers, a collection of poignant, private yet profound poems; and Alex Zorychta, Asst. Dir. for Technology Entrepreneurship, Program Dir., Works in Progress, UVA, on inspiring innovative entrepreneurial students to create start-ups, non-profits and new technologies. Apropos Of Something seeks out guests who are passionate about the arts, politics and society at-large. Co-hosts Ellen Daniels in Charlottesville and Nancy Laurence in New York City chat with experts, activists, and the most interesting people they can find. We guarantee every show will be Apropos Of Something. Join Ellen and Nancy on 94.7 WPVC the Progressive Voice of Charlottesville, every Saturday from 10-11 a.m.
Apropos Of Something hosts Ellen Daniels and Nancy Laurence talk with Karen E. Bender, Visiting Distinguished Prof. of Creative Writing, Hollins Univ., fiction editor, Scoundrel Time, award-winning author, on her politically timely book of short stories, The New Order; and Susan Devan Harness, oral historian, speaker, noted author, on her new memoir Bitterroot, the emotional and complicated journey to unearth her American Indian past. Apropos Of Something hosts Ellen Daniels and Nancy Laurence talk with Meredith D. Clark PhD, journalist, author, Asst. Professor, UVA Department of Media Studies, on the wide-ranging impact of black twitter and the digital archiving of social justice; and Preston Lauterbach, music journalist, award-winning historical author, VA Humanities Fellow, on his new book Bluff City, which chronicles the secret life of photographer Ernest Withers. Apropos Of Something hosts Ellen Daniels and Nancy Laurence talk with Brian Noyes, proprietor, baker-in-chief of Red Truck Bakery, about his nationally-recognized, rural VA sweet spot and its new cookbook; and Adam Nemett, award-winning writer, co-founder MIMA Music, creative dir. History Factory, filmmaker, on his debut novel We Can Save Us All — modern day superheroes battling the collapse of civilization. Apropos Of Something hosts Ellen Daniels and Nancy Laurence talk with Shilpa Dave PhD, Asst. Dean, UVA College of Arts & Sciences, Asst. Prof. of Media Studies and American Studies, on how pop culture’s ethnic representations keep shifting in an interconnected world; and Cathy Barrow, award-winning author, cooking teacher and food preservation expert, on why pie is an endlessly fruitful endeavor, even when it’s savory. Apropos Of Something hosts Ellen Daniels and Nancy Laurence talk with Charles Shields, award-winning, best-selling biographer of mid-century novelists, on his writing process and his noteworthy subjects– Harper Lee, Kurt Vonnegut and John Williams; and Heath Hardage Lee, historian, curator and award-winning, critically-acclaimed author whose most recent work The League of Wives — the untold story of women’s relentless efforts to bring their Vietnam MIA and POW husbands home– has been optioned for release as a major motion picture by Reese Witherspoon’s production company. Apropos Of Something hosts Ellen Daniels and Nancy Laurence talk with Claudrena Harold PhD, Prof., Carter G. Woodson Institute for African-American & African Studies and Corcoran Dept. of History, about black activism on campus, its efforts in the courts and its expression in our culture; and Jahan Ramazani PhD, UVA Prof., Edgar F. Shannon Prof. of English, on imagining our way into the experience of other cultures thru the transnational riches embedded in language. Apropos Of Something hosts Ellen Daniels and Nancy Laurence talk with Tracy Howe, Founder of Restoration Village Arts, songwriter, activist, music producer, on building harmony, not walls, on the southern border; and Angela Ciolfi JD, Director of Litigation and Advocacy, Legal Aid Justice Center, Cville, on how she’s challenging policies that perpetuate poverty. Apropos Of Something hosts Ellen Daniels and Nancy Laurence talk with Leslie Hubbard, Program Director for Student Learning and Initiatives at UVA’s Contemplative Sciences Center, on the value of adding mindfulness and meditation to a course syllabus; and Gregory Lewis, Head Sous Chef at Cville’s Maya Restaurant, on creating a menu steeped in southern style. 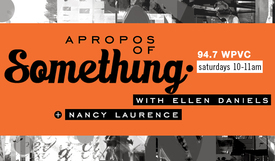 Apropos Of Something hosts Ellen Daniels and Nancy Laurence talk with Tish Jennings PhD, Assoc. Professor at UVA’s Curry School of Education about her internationally recognized work fostering compassion in the classroom, including her latest book, The Trauma-Sensitive Classroom; and Frank Dukes PhD, Distinguished Institute Fellow, Institute for Environmental Negotiation, exec. dir. UCARE at UVA, on his expertise mediating conflicts in collaborative change projects, be they environmental, economic or social. Apropos Of Something hosts Ellen Daniels and Nancy Laurence talk with Kyrill Kunakhovich PhD, UVA Asst. Professor, Corcoran Dept. of History, author, editor, on what life is like in dictatorships; and Kelley Fanto Deetz PhD, Dir. of Programming, Education and Visitor Engagement, Stratford Hall, historian, author, on taking our slave history out of the shadows. Apropos Of Something hosts Ellen Daniels and Nancy Laurence talk with Angela Taylor MD, Assoc. Professor, UVA School of Medicine, Dir., UVA Medical Center’s Cardiometabolic Network, on her concerted efforts to improve the physical health and food health of those living in the Dominican Republic; and Alexis Mason, ESTEAM Summit for Girls co-founder, Gifted Resource teacher, on giving kids the tools to chart their own career path. The Charlottesville Podcasting Network provides lectures, radio shows and more from throughout Charlottesville and Albemarle County. Make sure you stay in touch! The Charlottesville Podcasting Network is a public service by residents of Charlottesville and Albemarle County in Virginia, USA. All the material you see here is the copyright of its owners and is used here with permission.